In today's multicultural society you are increasingly likely to meet and make friends with people from different religious backgrounds and may be invited to share their celebrations. When this happens it is a special honour, and of course you want to respond appropriately. So Do I Kneel or Do I Bow? could well be just one of the questions you want an answer to. What should I wear or not wear? What is the appropriate clothing for the occasion so as not to give offence? Should I take a gift? If so, what? What is happening in the service? Do I sit, stand, kneel or bow? Do I hold back or join in? In short, how should a good guest behave? Whatever the occasion Do I Kneel or Do I Bow? What You Need to Know when Attending Religious Occasions is an absolutely essential handbook. 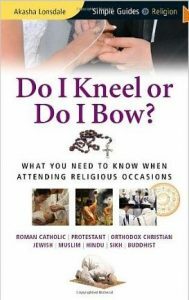 It's a comprehensive, easy-to-read guide that describes and explains the ceremonies of each faith and offers sensible advice on what to expect and how to behave. I was commissioned to write this book by Kuperard, an imprint of Bravo Ltd, who publish the Simple Guides series. As an ordained OneSpirit Interfaith Minister it was 'heaven sent' and allowed me to connect with some wonderful people from the different faiths mentioned. All the information has been validated by a faith leader from each religion. It took me a year to research and write and was a labour of love. Enjoy! PS: It has been distributed in the United States and Canada by Random House.